Sired by Lakota’s Hurricane Cruz, Bodhi is a strikingly handsome brown lab with a stylish point, drive to last all day, and an incredible nose for birds. 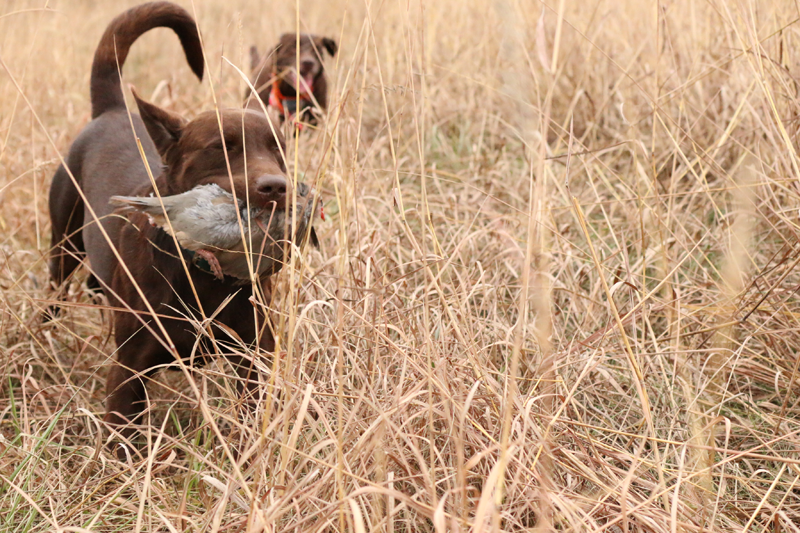 Whether he’s working in the water or the upland field, Bodhi aims to please as a hunting partner. As a personal companion and family pet, Bodhi’s sweet disposition always makes him a pleasure to have around the house. Trainer Mike Lettau of K & L Kennels enjoyed Bodhi’s company so much that he could often be seen riding shotgun in the front seat of Mike’s Mule, rather than in back with the other dogs. Bodhi’s innate pointing ability has been evident since he began locking up in solid tripod points on quail wings at 9 weeks of age. He has matured into a dog that knows how to work the cover, be patient with the point, and always bidable– despite his incredible drive for birds. 4x GMPR by 22 months of age, making him the second youngest 4x GMPR in APLA history. Pups Black and yellow pups available- Bodhi x Izzy breeding whelped 4/13/19. Bodhi is featured in the 2015 Just Labs Calendar published by Willow Creek Press. Calendar available online and at many local retailers. Bodhi became the second youngest 4x GMPR in APLA history at only 22 months old at the Armour, SD, hunt test on September 28, 2013. Bodhi became a 3x GMPR at the Shioctin, WI, hunt test on September 8th & 9th. Bodhi earned his Senior Hunter title at the Valley, NE, AKC trials at 18 months old. Bodhi became a 2x GMPR at the Decorah, Iowa, hunt test at the age of 18 months. "He is as handsome as he is talented. Bodhi is hard-charging in the field and comfortable and calm in any situation--whether on the line or in the house. He has a beautiful, staunch, natural point and is a rocket in the upland field."